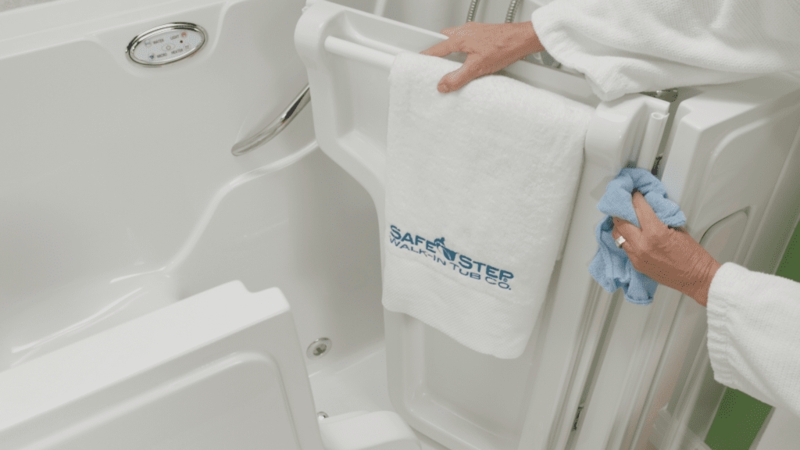 Your Safe Step Walk-In Tub is designed to provide you with many years of enjoyment and relaxation. It offers many features to aid in safe bathing, but your walk-in tub can also provide tremendous therapeutic value. Your tub is made of strong acrylic and gelcoat materials. These help your tub avoid discoloration and provide years of reliable service. Every electrical component of the tub is tested and conforms to all applicable standards of safety. We rigorously test and inspect each walk-in tub before it leaves our factory, with an eye toward your safety, satisfaction and peace of mind! It takes care and cleaning to keep your tub working efficiently. Be sure to clean the tub’s fixtures and surfaces regularly. When you clean your tub, DO NOT use wire brushes, steel wool or other abrasives. Epsom Salts will not harm your tub, when used in moderation. The electrical components of your tub require no maintenance. To keep your tub clean and working efficiently, regular care is required. This care includes the tub, door bulb seal fittings and internal water carrying pipes of the system. Oils or oil-based bath additives are not recommended for use in the tub. However you may use a few drops of essential oils in the aromatherapy compartment . When you are finished using your tub, be sure to rinse all surfaces with the shower wand with the water set to WARM. Once a week, wash all of your tub’s surfaces using a mild solution of acrylic-friendly cleaner. Each month, purge and clean the tub’s entire system. If body oils, bath oils, soap residue, etc. begin to build up on your tub’s surfaces, you can remove them with automatic dishwashing soap and a cup of bleach. Using warm water, fill your tub to a level just above the highest whirlpool jet. Mix a cup of bleach and a spoonful of automatic dishwashing soap into the water. Turn your system on, let it run for 15 minutes, and then drain the water. Now, refill the tub with warm water only. Let the system run for an additional 15 minutes. This will rinse out the plumbing. Drain the tub, use the shower wand to rinse off the surface, and then wipe with a soft clean cloth.